1. Put the sweet potatoes in a saucepan, cover with boiling water and cook for 10-12 minutes until tender. Heat 1 tbsp olive oil in a frying pan and fry the aubergine, stirring frequently, for 5 minutes. Add the peppers and another 1 tbsp oil and fry for a further 10 minutes until the vegetables are tender and browned. 2. Drain the sweet potatoes, return to the saucepan, season and mash until smooth. Spoon onto serving plates and top with the vegetables. 3. Briefly fry the halloumi in the frying pan with the remaining oil to lightly colour and spoon onto the plates. Add the honey, balsamic and 3 tbsp of water to the pan and heat until bubbling and slightly syrupy. Drizzle this over the vegetables and serve. 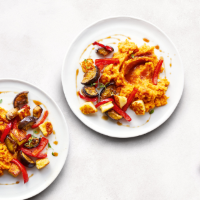 Cook’s tip Make this recipe dairy free by using Taifun Olive Tofu in place of the halloumi.